Situated in Salcott Street, adjacent to the playing field, the Village Hall (formerly the Village School) provides a community resource for meetings and events. The Hall has been recently refurbished and can seat around 50 people. It has a ramp for access and a toilet for people with disabilities. The hire charge includes the full use of the kitchen, with crockery and cutlery. There is on-road parking adjacent to the Hall. Please call 01621 869289 if you require information about availability and hire charges. For any other information please use their email address. You can also check their website for upcoming events. 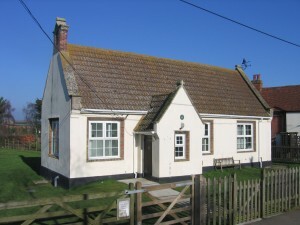 The Village Hall was originally the village school. In 1869, Thomas Powell, a local landowner, conveyed a piece of land, 76 feet by 80 feet, to the Diocese of Chelmsford for the erection of the ‘Salcott and Virley Church of England School’. In the following year the school was opened, taking pupils up to the then school-leaving age of 13. This was increased to 14 in 1912, when a further classroom was added. (This was built of a single thickness of brick and, rumour has it, salt-water mortar, which we were to find out to our cost when our renovations started in 1996). Later, in 1920, Sir Anthony Abdy gave the land that we now know as the Meadow to the village, and this became the school playing field.